Alexander Tyulyakov, deputy director for administrative issues of the Russian state-owned Atomflot, which carries out repair work and spent nuclear fuel storage for Russian nuclear icebreakers and nuclear submarines, was arrested last week amid a swirl of gossip that he was trafficking in guns and radioactive elements. After the announcement of Tyulyakovs arrest on Thursday, Northwestern European news services picked up the story and reported that Tyulyakov had been arrested as an international nuclear materials smuggler and arms dealer. But a host of other rumours in the air in Murmansk&#151including ones regarding nuclear smuggling&#151suggest the deputy directors alleged crimes may lie within simple and poorly concealed white collar embezzlement from Atomflot. However, Murmansk region police and the Murmansk branch of the Federal Security Service, or FSB&#151the KGBs successor&#151say they can link Tyulyakov to a weapons trafficker who had received an order for what police presume is a radioactive substance for a buyer in one of the Baltic states. Tyulyakov is now in police custody and it is not clear with what or when he will be charged. According to a spokesman for the Murmansk regional Ministry of Internal Affairs, or MVD, who declined to be identified, Tyulyakov was arrested after a search of his home allegedly revealed an arsenal of guns. A frisk of Tyulyakov carried out during his arrest on a Murmansk street turned up an unknown strategic substance that police are saying could be radioactive. This version, though it seems dubious, given that carrying radioactive substances presents a risk of radioactive contamination of the alleged thief, may well turn out to be the truth: Cases of radioactive theft in Russia are quite numerous. Other charges rumoured to have been behind the Tyulyakov arrest, according to Murmansk newspapers, were: his alleged plans to sell fuel assemblies from a nuclear icebreaker for $50,000; that he was supposedly caught red-handed with nuclear waste from Atomflot, and that emissaries of a former Murmansk gubernatorial candidate tried to buy radioactive materials from him. All of this gossip, said the MVD spokesman, was untrue, though he refused to elaborate on what, in fact, was the truth behind the arrest&#151including the confiscated weapons and the investigation of the substance found on Tyulyakov. He also declined to comment on whether or not the supposed embezzlement scenarios were part of the charges being drawn up against Tyulyakov. The material that was seized from Tyulyakov was sent to a laboratory in Apatity, a city in the Murmansk region, for analysis. As of Friday, the lab had not determined whether the substance was radioactive. A spokesman for the laboratory would comment no further on the case. Atomflots chief, Alexander Sinyayev, in an interview with the Murmansk-based newspaper Nord-Vest Kuriyer on Thursday, was quick to say that the arrest had nothing to do with Tyulyakovs activities for the company, which presumably means Sinyayev does not think the arrest has to do with embezzlement. He added, however, that his knowledge of the arrest, and the charges being filed against his deputy director, were sketchy. He told the paper that Atomflot is working at a normal pace in the wake of the arrest. Despite several attempts by Bellona Web, Sinyayev could not be reached for further comment on Friday. One member of Atomflots top management, who requested anonymity, said that investigators had not even questioned representatives of Atomflot about the origin of the unknown substance. According to this source, there are actually no strategic substances to be found in Atomflots possession. But another anonymous source, who asked not to be identified in any way, said Tyulyakov responsibilities at Atomflot&#151as its administrative oversight manager&#151made him the constant source of attention from local authorities, presumably because there were broad opportunities for skimming and embezzlement in his duties. If, in fact, Tyulyakov was perpetrating any sort of fraud, said the source, then it was poorly concealed. Among Tyulyakovs personal assets were reportedly a luxurious summer home, a well-appointed apartment, and a foreign car&#151all of which raised eyebrows among law enforcement agencies. 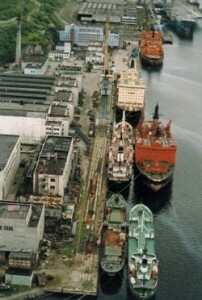 As deputy director for administrative issues, Tyulyakovs duties, according to the source, were purchasing oil for the Atomflots boiler system, selling scrap metal, organisation and purchasing of supplies, food and beverages for the management cafeteria&#151which featured an open buffet that sold hard liquor. Workers at Atomflot who were interviewed by Bellona Web said they thought Tyulyakovs arrest was not surprising, and many thought his activities for the company were poorly executed smokescreens to bilk cash from Atomflot. If Tyulyakov is charged with harbouring the weapons allegedly discovered at his home, and the strategic substance he was allegedly caught with turns out to be radioactive, he faces up to 10 years in prison. This possible scenario would be reminiscent of a 1999 theft of the radioactive element californium 252 and 17 kilograms of mercury from Atomflot by a group of specialists who had worked with these materials&#151a technician from nuclear support ship Imandra, a reactor decontaminator from the nuclear icebreaker Rossiya, and his son, a programmer in a St Petersburg military installation. According to police documents obtained by Nord-Vest Kuriyer and confirmed to Bellona Web by St Petersburg police, the Rossiya crew member was approached in Murmansk by a black market customer offering $100,000 for the californium 252, which the Rossiya crewman knew would be at Atomflot. But due to various reasons the deal fell through. The californium 252 was eventually stolen, and the Imandra technician, the Rossiya crew member, and his son, contrived to try again to find customers for their loot&#151this time in St Petersburg. By then, they had already stolen the mercury, too. They loaded the radioactive materials into the trunk of a car and covered them with paraffin. However, despite the paraffin and plenty of water the three brought along on the 800-kilometre journey to help reduce the impact of the radioactivity, the radiation dosages within five metres of the car trunk exceeded healthy norms by 350 times. By the time the three arrived in St Petersburg, agents from the Anti-Organised Crime Unit, as well as the FSB, had been tipped off on the case. Undercover investigators arranged a meeting with the Murmansk trio, and agreed on a price of $50,000 for the container of californium, and $10,000 for the mercury. When the group met the undercover agents with the substances, they were arrested. The health of the three nuclear black market dealers is unknown, according to an official with the St Petersburg Anti-Organised Crime Unit. But according to experts who consulted the official, who was involved in the arrest, their condition is not likely to be good. Californium 252 is suitable for the dirty bombs so feared after September 11th 2001. It can also be successfully used for murder as an instrument of slow poisoning. Even in small quantities, if placed within proximity of the intended victim, said the official from the Anti-Organised Crime Unit, californium 252 can kill over a period of several days. Bellonas Murmansk office contributed to this report.